Christmas is almost here and this year we opted not to have a Christmas tree. With just the two of us here at home and the only place to put one is in a spot where it is hardly seen, it just didn't seem worth the bother of cutting it down, decorating it, undecorating it and remembering to water it. So we decided to settle for just putting out all the rest of the Christmas decor. Needless to say, that made Christmas decorating go lickety split this year! We've split and stacked the wood, moved the shovels and generator to the front of the garage where they will be handy when needed, and put out the driveway markers so we know where to shovel when the snow is down, and the studded snow tires are on the vehicles. So we are all set and ready for winter. We aren't looking forward to it, but we're ready. We even got ourselves some snowshoes. Now hopefully when the snow falls I'll have improved my fitness enough to be able to use them! We've already had one ice storm which took the power out for awhile. Once again, we were feeling pleased with ourselves for having put in a wood stove last year. 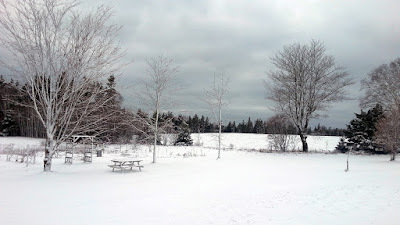 And there was one snow fall that made everything look pretty for one day. By next day it had all melted and was green again. 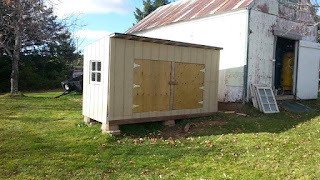 The chicken coop is nearly done. 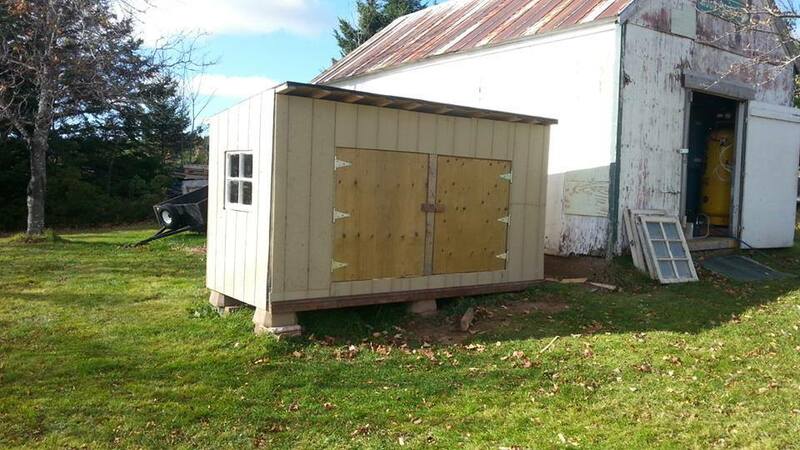 It needs a little trim and some paint, and then we are ready for the chickens. Next spring we'll have about 6 chickens running around clucking and cooing. It will be interesting to see what the cats think of them if they venture close to the catio. One thing that is common here on the island is storms that keep people cooped up. Sometimes an ice storm, or wind storm or snow storm. Invariably the power goes out and everyone is huddling up and making do. 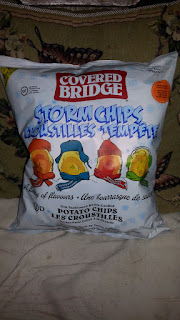 As a result, the island seems to have a tradition called 'storm chips'. I'm not sure how or when this started but everyone likes to joke around and ask 'have you got your storm chips?' whenever there is a storm predicted to hit. And they do stock up on potato chips to weather out the storms. But the other day in the grocery store, I stopped dead in my tracks. Yep, someone decided to use that as a marketing ploy. I had to buy this just once, just so I could take a picture. Keiko has been quite busy in the catio. I've lost count how many critters she has caught out there. It seems that being fenced in hasn't curbed her hunting abilities one iota. The only issue I have is when she brings things into the house. Sometimes dead and half eaten, sometimes alive. There was the day she brought a mouse in to play with. It was still alive and scared witless. Of course the minute I got her to drop it, it scurried off into the wood pile in the mud room. Trying to catch the little devil to get him back outside was no easy task! Then there was the day when she decided to present me with one of her kills. I was busy vacuuming and she came from behind and dropped a dead chipmunk behind my feet. Of all the days to choose to be barefoot instead of in slippers. When I stepped back and my bare foot landed on something soft and squishy I let out a scream that could curdle milk. My scream succeeded in startling Keiko who was still sitting there waiting to see my gratitude for the gift. This caused her to leap up and turn to run out the door. However, in her haste to make an exit, she missed the doorway and instead ploughed full speed into the door. Her head on the wooden door made quite the loud crack and when I turned, there she was sitting and shaking her head. If this had been the cartoons, there would have been a ring of birds flying around her head. 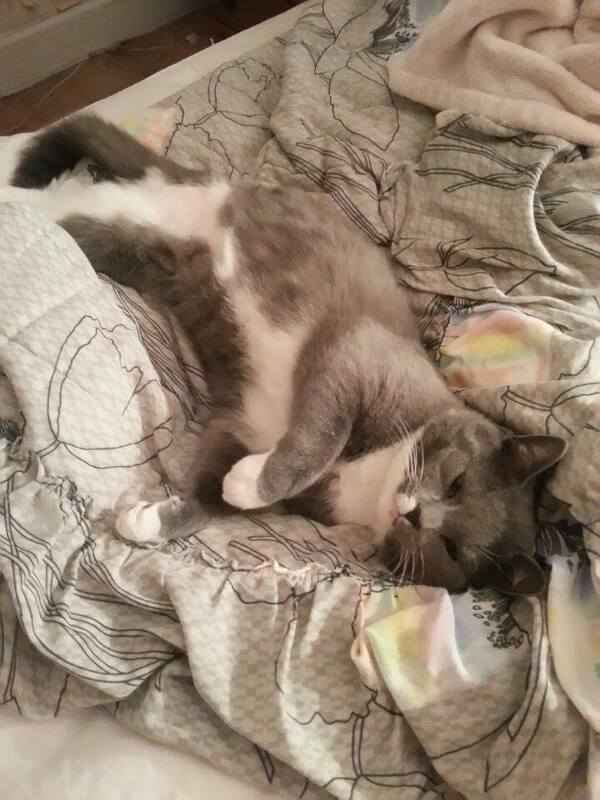 As I reached down to see if she was alright she hissed at me and tore out of the room. I guess it wasn't quite the response she was expecting for the lovely gift. 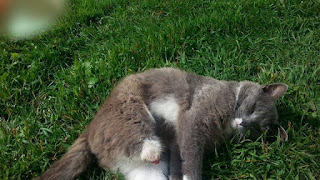 Finally, an update to our 3-legged stray that turned up a few months ago. The animal shelter took care of the infection, removed the rest of the leg and neutered him. He quickly adjusted to having the whole leg gone instead of a dangling infected stump. He was adopted into a family with a farm that has other special needs animals. Apparently he settled in very quickly and is now getting spoiled, sleeping in beds and generally living the dream. So glad I won't be watching him this winter, struggling to climb over the snow banks in freezing temperatures. He's warm, well fed and well loved now. I love stories with happy endings! So as we get closer to Christmas Day, it's a good time to remember those we miss. A time to remember those who are still with us, by giving them the gift of our time and attention. And a time to share with others less fortunate. There are lots of toy drives, and charities this time of year so if you can, share a little with those who are in need. If we can all contribute even just a little, we can help to ensure that on Christmas Day, everyone has a smile. Christmas is about family, friends, and love. It's about community, sharing and forgiveness.